For what you’ll pay a gourmet grocery store or bakery for a couple of slices of fruit tart, you can buy yourself a tart pan and make this incredibly simple fresh fruit tart anytime you want! 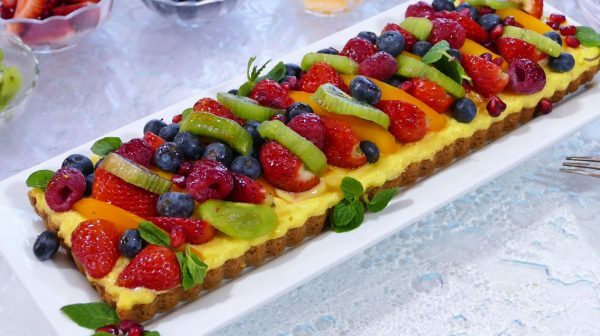 It’s going to really surprise you how easy it is to make a cookie crust, whip up some pudding and top with a few pieces of colorful fruit in season. In fact, I’m about to bust the myth that it’s a dessert to admire and buy, but never attempt. You will need a pan with a removable bottom, but it’s a pretty inexpensive purchase. I bought the traditional rectangular 14 inch by 4 inch tart pan, but you can buy an 8 inch square or even mini tart pans. The base is made from the cookie of your choice. I love the shortbread flavor with pudding and fruit so I opted for Pepperidge Farm Chessmen. You can also use vanilla, chocolate or lemon cream sandwich cookies (like Oreos). It just depends on what pudding and fruit you are using. For this recipe I stayed with the traditional vanilla base. Want to know how bake shops get that shiny glaze on the fruit? I’ve included the directions for that, too. Want a wow dessert? You’ve got it! Pre-heat oven to 350 degrees. Grind cookies in food processor to fine consistency. Place ground cookies in a bowl. Melt butter and pour over cookies. Mix until consistency is like wet sand and presses together. Press into base and up the sides of tart pan (I used a standard rectangular 14" by 4" inch tart pan.) Bake at 350 degrees for 12-15 minutes or until light golden brown. Add milk to large bowl. Sprinkle both packages of instant pudding over milk and whisk continually until pudding thickens. (You can also use a mixer). Spread pudding over baked crust, filling to top of tart tin. Refrigerate for 15 minutes so pudding thickens. (Note: Depending on the size of the tart tin or tins, you may have extra pudding left over.) Clean and slice you desired fruit. Arrange over top of pudding. Add a few whole mint leaves for garnish. For a glazed finished, microwave jelly for about 5 seconds or until liquefied. With a pastry brush, coat fruit lightly with jelly glaze. (This will allow fruit to not wilt if making tart ahead.) Slice and serve.